A District ice cream shop is giving away sweet treats to patrons who donate to a local writing organization. Ice Cream Jubilee, which has locations in Logan Circle and Yards Park, said it will hand over a “winter seasonal” milkshake to every patron who gives at least $5 to 826DC, a nonprofit focused on teaching kids about writing. This holiday season, Ice Cream Jubilee is proud to continue its tradition of supporting local non-profits that support Washington, DC children learn and express their creativity. This year, we are partnering with 826DC, a local nonprofit organization dedicated to supporting students ages 6-18 with their creative and expository writing skills, and to helping teachers inspire their students to write. Ice Cream Jubilee is delighted to present a fun and delicious challenge to Washington, DC ice cream lovers that supports 826DC’s writing programs: create your own ice cream milkshake with our winter seasonal flavors, and receive it for FREE with a donation to 826DC of $5 or more. Each milkshake creator can choose from 5 flavors for their creation: Boozy Eggnog, Maple Rye Pecan, Pumpkin Honeycomb, Salty Apple Cinnamon, and Bold Vanilla. We suggest a Pumpkin Eggnog milkshake or Caramel Apple milkshake. Ice Cream Jubilee will also present a special prize to the milkshake creator who posts the most delicious looking and sounding photo of their creation on social media. This challenge begins on Tuesday, December 13 and continues through December 31. Nutella Hot Chocolate – Three types of chocolate – melted dark chocolate, hazelnut Nutella, and cocoa – make this creamy, rich hot chocolate the best in the city. Earl Grey White Hot Chocolate – Our homemade earl grey lavender syrup sweetens our twist on hot chocolate, made with melted chunks of white chocolate and steamed milk. Hot Coffee Float – Amp up a cup of Zeke’s local roast by adding a scoop of any ice cream flavor. Bold Vanilla is a classic, while Pumpkin Honeycomb or Maple Rye Pecan adds rich, surprising fall flavors. Ice Cream Jubilee proudly represents Washington, D.C. on multiple “Best Ice Cream in America” lists, including Food & Wine magazine, Thrillist, Tastemade, and TimeOut magazine. Ice Cream Jubilee’s flavors and the story of founder Victoria Lai has also been featured by NBC Nightly News, Travel + Leisure magazine, FoodNetwork.com, and More magazine. 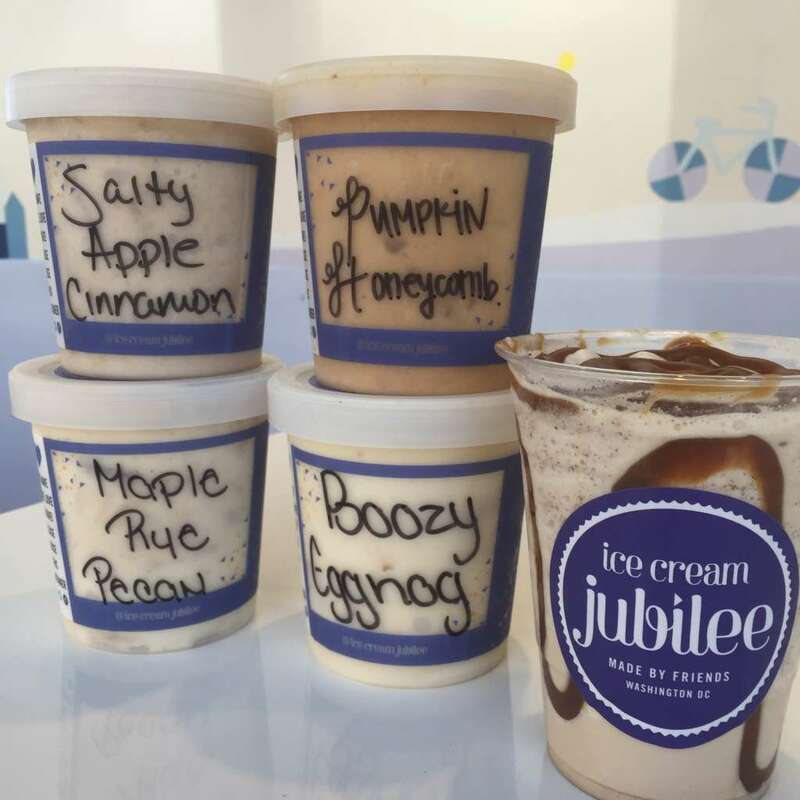 Ice Cream Jubilee was named “Best Ice Cream Shop in DC” by the readers of the Washington CityPaper in 2015 and 2016 and has won the Editor’s Choice award in Washingtonian Magazine in 2014, 2015, and 2016. Ice Cream Jubilee’s Logan Circle location at 1407 T Street NW is open from 12pm – 10pm. Ice Cream Jubilee’s Yards Park location at 301 Water Street SE is open from 12pm – 9pm.